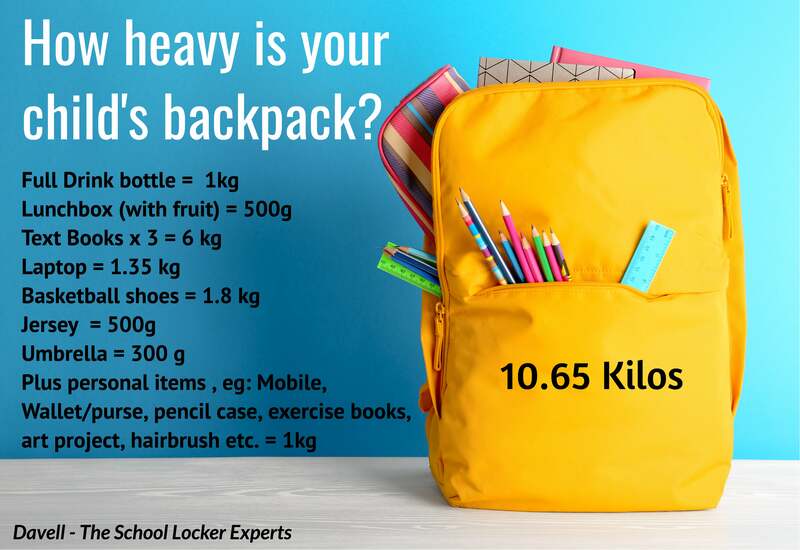 With the start of another school year, our children are still bearing heavy loads and questions are being asked about how this affects their health and fitness. Experts, including the Australian Chiropractors Association recommend using lockers as a way for children to avoid bearing the brunt of their backpacks all day. There is now greater emphasis on freedom of movement throughout the school years. Just as adapting school uniforms can support greater physical agility, introducing school lockers can encourage more active behaviour patterns. Active and independent children must be able to move freely. The Active Healthy Kids Australia campaign acknowledges that parents have concerns about heavy schoolbags discouraging mobility. The Centre for Allied Health Research at the University of South Australia found instances of 35 kg children carrying bags weighing up to 15 kg – it’s like asking an average adult to carry a 40 kg bag all day and enjoy chasing, skipping and climbing the monkey bars, and then walk home. As we discussed in October, about 70 per cent of Australian school students report suffering from backpack pain. The day-long shifting of heavy weights from shoulder-to-shoulder contributes to back pain and fatigue. At Davell we are happy to be part of a solution with our range of school lockers to alleviate the day-long load. 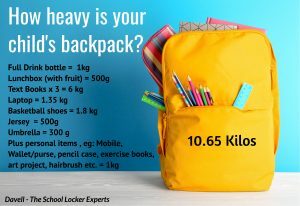 Schools like Newington College, Shore School and Tara Anglican College have been getting on board by providing lockers on the school premises so students can stow their backpacks plus the extra books, laptops, sports equipment and water bottles that now weigh them down. Regularly weigh your child’s backpack using the bathroom scale, baggage weight hook or digital luggage scale. (As a guide, if aiming for a maximum of 10% of your child’s body weight then a 7-year-old weighing 25 kg would carry a maximum bag weight of 2.5 kg). Assist your child to regularly prune schoolbag contents. Suggest they fill their water bottle after they get to school. Encourage locker use at school. Work with the school to allow students enough time between class to utilise their lockers. Work with the school to reduce textbook weight where possible (paperback rather than hardback books, tablets rather than laptops, curriculum material on school website). Consider how school lockers can help your child. Read Davell’s School Locker Buying Guide and view our extensive range of Australian made lockers designed to accommodate school backpacks, sports bags, laptops, text books, school blazers and personal items all in the safety of a secure steel locker.